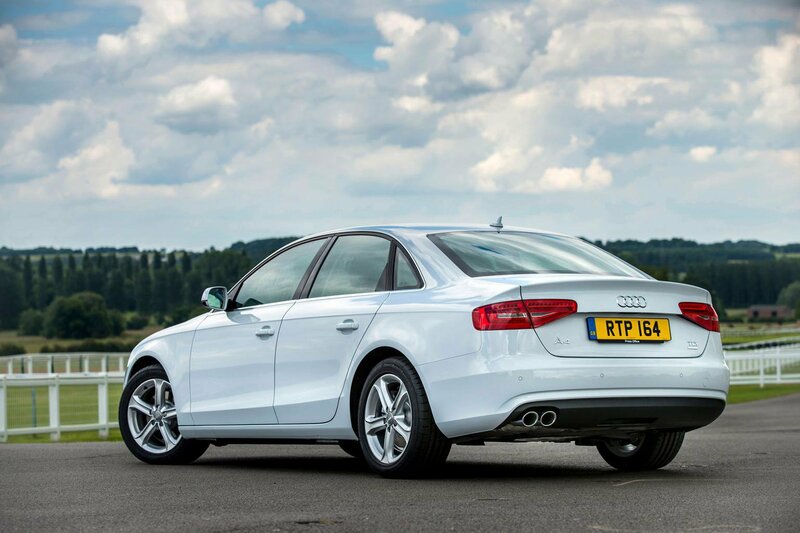 2014 Audi A4 2.0 TDI Ultra review | What Car? This version of the Audi A4 won't be around for much longer, but Audi is keen to keep its popular executive model as up-to-date as possible with the latest technology, including its efficient 'Ultra' diesel engines. We've already tested the estate (Avant) A4 Ultra, which is heavier than the four-door saloon, but still manages an impressive 64.2mpg and pumps out 114g/km - closing up the gap to its nearest rivals when it comes to performance and running costs. As a saloon, the A4 Ultra returns a claimed 67.3mpg and emits 109g/km of CO2, putting it on a par with the BMW 320d Efficient Dynamics (109g/km), and only slightly behind the new Mercedes C220 Bluetec (103g/km). It's only available with a six-speed manual gearbox, but you can choose between SE and SE Technik trim. Can a new engine really breath new life into one of the oldest models in Audi's line-up? What is the 2014 Audi A4 2.0 TDI Ultra like to drive? Let's start with the good news. The revised 161bhp diesel engine revs freely and without sounding harsh when you accelerate hard. There's more torque then before, which helps the Ultra feel a tad more responsive, while maximum power arrives a lot earlier than it used to (at 3000rpm). This improved flexibility means you can punt along in town at low revs, without feeling like you need to change down into a low gear. Once the engine picks up, there's a progressive surge of power, and more than enough oomph for fast overtakes. The A4 Ultra is impressively quiet whether you're driving at low speeds or cruising on the motorway, to the point where you’re more aware of the rush of wind noise instead of any engine thrum. True, there's whine from the turbo when you put your foot down hard, but it's less noticeable than in the old 2.0-litre TDIe. A light clutch and precise gearshift make the A4 Avant easy to drive – even in stop-start traffic. However, the new engine can only do so much, and there are still some niggling issues. There’s often a noticeable vibration through the pedals and gearknob, for example, particularly at idle, but also when accelerating. The handling is also pretty unremarkable. While the steering is accurate, the front-wheel-drive A4 feels heavy, and the front wheels always want to wash wide through tight turns in the road. There's also an inconsistency to the steering assistance when you're turning into corners. The A4 never feels unstable, but it's never particularly engaging, either. Ride comfort is another bugbear. Despite the Ultra having not particularly low-profile tyres (it comes with 17-inch alloys as standard), it has lowered suspension to reduce drag and improve fuel economy, and isn't that effective at dealing with cracks and potholes in town, while expansion joints thump their way into the cabin at motorway speeds. Nothing has changed inside, so you still get a mostly classy, well finished interior, with fairly high-quality materials and a reasonably clear, easy to use layout. However, the shortcut buttons around the MMI control dial are made from hard, shiny plastic and look out of place. A more serious problem is the off-set pedals, which will be an issue for all drivers, because the A4 Ultra is available only as a manual. This makes finding a comfortable driving position trickier than you'd expect. Newer rivals such as the Mercedes C-Class and BMW 3 Series are both a little more high-tech inside, and the BMW in particular has a slicker, easier-to-use infotainment system. The A4's MMI unit is decent enough, but the shortcut buttons aren't as straightforward and the graphics aren't as sharp. There's enough space inside to seat four adults comfortably – five is a squeeze – with decent head- and legroom for those in the front and the back. The boot is a good size, with a square load floor and a low lip that makes loading heavier items a breeze. SE trim comes with climate control, auto lights and wipers, a DAB radio, rear parking sensors and a 6.5-inch colour display. If you fork out an extra £1,000 for the SE Technik model then you also get leather upholstery, sat-nav, all-round parking sensors and an iPod connector. The Ultra definitely is the new pick of the A4 range, thanks to improved refinement and lower running costs that make it more competitive than before. At £27,675, it's about £1000 cheaper than the sharper driving BMW 320d Efficient Dynamics, and around £1700 cheaper than the cleaner Mercedes C220 Bluetec. However, it now feels a fair bit less plush inside than both these rivals, despite its smoother, quieter engine. The practical Avant has more going for it, but this saloon now feels distinctly average. New Tesla Model 3 vs Tesla Model S: which electric car is best?